Three couples take on properties in Wednesfield near Wolverhampton, Sydenham in London and Chatham in Kent in the hope of making some money. Hello, and welcome to the show. can seem like a daunting prospect. Yes, but if you do your homework, you could be onto a winner. is at your local property auction. Property auctions are a great place to pick up a potential bargain. Yes, but one thing you've got to remember is always stay calm. got an attack of auction fever. Today in Wednesfield, this semi has got me feeling poetic. RSJ... Open the door on a summer's day! The thingy there, what's it called again? Socket! That's it. Thank you. And in Chatham, the rooms in this end terrace left me pondering. It's too big, you don't need it! just two miles from the city centre of Wolverhampton. specialised in traps for winning game. so Wednesfield became the trap-making capital of the world. So, will somebody snare a bargain with this property? it says it's got three bedrooms and a guide price of £78-83,000. It also says it's a semidetached. It looks more like an end of terrace to me. Interesting though, let's have a look. # Look into my eyes, can't you see they're open wide? # Would I lie to you, baby? Very typical layout of a house of this era. Look at this, all original stained glass as well. It's a little bit tight. Here are your stairs going up to the bedrooms. and more stained glass as well at the top. that's retro that's going round the top of the wall. And there's a gas fire as well, and I'd want to get rid of that. But it's a good-sized front room. Bit further down the hallway, you've got a very tight kitchen. by the back door that goes out. And then you come into the dining room. Another gas fire in here as well. OK, so you've already got a door in place. Out into the back garden. And you've got a dining room. And on the other side of this wall, you've got a kitchen. kitchen/diner - that's what you've got to try and achieve! What I would do is try and make better use of these two spaces. This is how I'd do it. Wall not needed. Open the door on a summer's day! But will it be all sunshine and roses upstairs? OK, upstairs to the three bedrooms. But before we have a look at those, this is the family bathroom. And it's not a bad-sized family bathroom at all. You've got a bath, sink, and a toilet just behind the door. put a brand-new suite in, try and get a shower in the bath as well. There's enough space, without a doubt. which is looking out onto the back garden. And again, it's a double bedroom. You've got a box bedroom just there. A bit tight, that one is. Somebody enjoyed that colour scheme! Into the main bedroom at the front of the house, nice big bay window. Really nice big bay window. but I think that's just the age of the house. I wouldn't think that's anything to worry about. Get it checked out, of course, as always. I do like these original doors, all over the house. And these handles as well. They are original handles, they've been here from day dot. This is a really nice house, it feels solid. good project to get hold of. Did you know that Bakelite was one of the first plastics? about this lot, guided at £78-83,000? The property is in not too bad condition. ..standard of workmanship and stuff like that. it's not going to take an awful lot of work. I think this could be a nice home for a couple or a small family. But it could also be a nice, simple one for a first-time investor. if you get it for somewhere near the guide price? I would envisage it selling in the region of £120,000 to £130,000. Typical with this style of house is the layout. in, which is really nice. It does need a bit of a tweak, though. going to work a lot better for modern living. I think you could be on to a bit of a winner. Let's find out who agreed with me when it went under the hammer! This next lot is a freehold, three-bedroom, semidetached house. Start me if you will. 90,000? What to buy this will be! At £80,000, and thank you. At 80,000, I'm bid, is it? At 90 now. At 80,000, I'm bid, is it 90? but gradually crept up with a few interested parties. We rejoin the bidding at £107,000. No? Are we all done, then? Could I see your number, please, sir? No. You've been a great bidder, sir, but with you, sir, at 109,000. Your number again was...? 780, or is 780. Congratulations, that property is yours, Mr 780.
who is a PA for a construction company. -Kevan, nice to meet you. -Nice to meet you. Debbie, nice to meet you too. Tell me who is responsible, then, for finding this house? Deb was the one that found the property. Are you taking the credit? I am taking the credit, yes! Now, are you happy with what she found, or...? I'm very happy with what she found, yeah! and she said it was really nice, so, yeah. What were you buying the house for? we'll look at maybe selling it on. OK, so is this your first venture together? Have you got any more ventures, or...? to come in and do an extension on it. "We've lived through them." What, hell or heaven? -we love being here with rollers in our hands. We love it, yeah. Just great fun. but these two sound like gluttons for punishment. And it won't just be rollers at the ready either! Much of the work we will be doing ourselves. We've got the kitchen waiting to install. Here, all the decor work, we'll be doing ourselves as well. and we'd love to use the same or similar people again. You know, your main trades - your electricians and your bricklayers. -The rest of it we'll do ourselves. So tell us... OK, let's start upstairs. Go on, just for a change, let's start upstairs. -What are you going to do upstairs? just tidy it all up. I think the bathroom will pretty well stay as it is. It needs some more tiles put in on it and a shower putting in. What other plans down here, then? Well, the flooring, original flooring, looks really nice. Same in this room. And the back room will stay as it is. but obviously changing the gas fires. Picture rails, as well, will probably stay. -Pretty cool the stained-glass, isn't it? And you've got it at the front door as well. -That'll frame the door. Very, very cool. Kitchen... It's a little bit tight. Any plans to make that a little bit bigger? in modern-day terms, what most people seem to want. So we could do that quite easily. -Yep, I want to knock the wall down, if we do it! She's handy with a sledgehammer, so watch out! seven maximum, if they decide to open up the kitchen/diner. Two bedrooms upstairs are identical! Identical, are you keeping them like that or...? No, no! We'll change it, that's my job, the decor. So, tell us, what do you want to do? and just make it a bit more attractive when you walk in. -Do you do wallpapering as well? Look at these two, I might take a card! Listen, I know you're going to get on well. I do like them. Genuinely a very nice couple. which should help with keeping the budget down. or will it be a kitchen/diner? This is Sydenham in southeast London. Dulwich Village to the north, and Forest Hill to the east. is the maisonette I'm here to see. Three bedrooms, guide price £100,000 plus. That sounds very, very cheap. 100K around here is a steal. Let's head up to this first-floor flat to check it out. So, what have we got? Oh, double-glazed front door. That's a good start. In fact, looking around, the bathroom there. Nice condition, the bathroom, actually. so that is going to save you a good expense for sure. Through the front door... Kitchen there. Now, I have to say I'm a bit disappointed. It feels a little bit pokey. It's got this very strange, sort of, thing on the end there. into the kitchen there, but it's just a bit weird. Then through into the living room. I'd like to see some kind of nice fireplace there. At the moment, it's like breeze blocks. it's not in bad condition. I mean, you could theoretically just rent this out pretty much as it is. A few issues here. That's actually quite a useful thing. Somebody's actually taken off the...the thingy there. What's it called again? A socket. what the condition of the electrics is. Obviously, be very, very careful if you do that. maybe needing updating in the not too distant future. You have got nice views out the garden here as well. but always get a certified electrician to check things out. There are two small bedrooms. The second has a really unusual shape. Fitting in furniture will need thought. is this maisonette comes with its own garden. but I do think it could be a cracking space. And it is London, and the guide is only £100,000 plus. What, really?! And there is even more. So, upstairs, and you find the third bedroom. And a nice additional feature for the flat for sure. the staircase, fire escape routes and things like that. But, on the face of it, it looks pretty good. to what is already a pretty good flat. Ah, let's take a moment to think. or seems, a lot cheaper than similar properties in the area. short lease. There is only 20 years left on the existing lease. a Section 42 notice has already been issued. and that's actually really good news for whoever buys this place. the shorter the lease, the more expensive it is to extend. So a very short lease like this could be pretty pricey indeed. which actually sounds on the cheap side. So, cue that Too Good To Be True number again. I think it is a great little flat. and a lot of space for your money. What about the short lease? Does he see it as an issue for the property? Short leases are a massive issue now, more these days than ever. will need to consider that a buyer will want that lease extended. You could sell it without lease extension, indeed. We do sell without lease extensions, but the value is massively impacted. So, just how much of an impact does the lease have? and around 330,000 with a long lease. but that short lease does mean it would be cash buyers only. potentially some good money to be made on this one. Let's see if who agreed when it went under the hammer. Who'd like to kick off on this? We rejoin at 160,000 - well past the £100,000-plus guide. And the bidding went up and up, and we rejoin again at 182,000. 184. 184, either of you? If not, it is going down here at 182. You are going to lose it. 184? But at least you had a crack. Well done. who picked it up for well over the guide price at 182,000.
and this will be her eighth renovation. I spoke to Kim about their purchase. Kim, lovely to meet you. Tell me why you wanted to buy this little place. First of all, it is local. It is about ten minutes' drive to where we live. And secondly, as you can see, it's in very good condition. what are you planning to do to it? rewiring, new boiler, and painting. I mean, I like the flat. The only thing I don't think is quite right is the kitchen. -It's really small, isn't it? -is, or are you going to open it up a bit? We are going to open some stud walls there, which is quite stuffy. -But otherwise, we are just keeping it as it is. or to rent it out? Depends. We will need agent advice, yes, yes. we have an option of renting it out. And what is the budget for the work? and they aim to get their builders in and out in just three weeks. Yeah, you heard me right, three weeks! a keen price was the lease issue, the short lease. Did you know all about that? We had the legal packs checked by the solicitors beforehand. So we knew there was only 20 years left on the lease. -I mean, so it was in the process already, so we took it over. do you have any idea how much it is going to cost, to extend the lease? Yes, yes. It was in the legal packs. -Oh, it was? OK. The actual amount. -Yeah. And that extends it 99 years. That's not actually as much as it could have been, is it? No, it wasn't a bad price at all, no. So, remind me what you paid at auction, in terms of the price. We ended up paying for 182. -Were you happy with that? -I was very happy, yes. and the works, about 230 or so. -You knew about that, did you, as well? Do you know how much it will be worth when that's all done? So, 80 grand in it, perhaps. or have you got other people involved? Because he was bidding at the auction, is that right? Yes, we went together and he was the bidder. Right. And what kind of skills do the both of you have? Do you have sort of building skills, anything like that? We are good DIY people, so just some, maybe, painting. But you work on your projects together, do you? Oh, yes. We do overlook the project. Yeah, good. Well, listen, congratulations. even with that 30 grand for the lease extension. I think there is money to be made here. But three weeks to sort the place out, including doing a full rewire? That's going to be tight. How will she get on? It's just really dark because there isn't a big window there. if trouble came a-knocking in Kim's maisonette. We received Counter Notice from the freeholder. it looked more like a terrace to me. a good living space but a pokey kitchen. So, you've got a kitchen and you've got a diner. that's what you've got to try and achieve. a standard box room, and two double bedrooms. Or was I seeing double? the walls are the same colour, the ceiling is the same colour. Somebody enjoyed that colour scheme. enjoyed this enough to buy for 109 grand on auction day. but were open to adding some more contemporary touches. Kitchen - it's a little bit tight. what most people seem to want, so we could do that quite easily. -Yeah. I'll knock the wall down if we do it. She is handy with a sledgehammer, so watch out. to cover the cost of the kitchen/diner. And they thought they'd manage the work in six to nine months. So when we returned a year later, did they manage it? And had Debbie been busy with that sledgehammer? like original wood flooring and stained-glass windows. Upstairs, the sympathetic renovation continues. It's a slick renovation from head to toe. The last time we spoke, they had planned to do the work themselves. So, was that the case? And did a Debbie actually manage to get her hands on that sledgehammer? Kev did most of the graft, but I did help where I could. painting... But you did the hard bit, didn't you? Done a reasonable amount. You've done your fair share. So, you know, we are a team, so that's what we do. Kevan did re-plumb and damp proof the kitchen. plus they have transformed the garden for good measure. They have done a great job, but what's been the hardest bit? For me, the biggest challenge is just the tiredness. you come here in evenings and weekends. The other thing was the damp. so then we had to rip skirting boards off and start again. so that has taken us longer anyway. so it took me out of the equation for a while. and here we are, just two or three months over our original timescale. Let's hope Kevan's back has made a full recovery. But is their seven-grand budget in perfect health? The original budget was around 7,000. We've actually spent just under 12,000.
when we decide what we are going to do with it. but they are not too sure now. Maybe two local estate agents can help them out. starting with the agent who saw it prior to renovation? and, wow, hasn't it changed?! to one that is now top-notch. The standard of finish has been very good, high standard. They've retained the original doors. So it's been really good. are just going to be able to move straight in. Like me, the agents think this is a lovely property. £145,000, and I would certainly expect to get a figure of £143,000. between £600 and £650 per calendar month. That's a yield of almost 6.5%. Now you've got the figures, guys, what do you think? and make our final decision as to what we are going to do. finishing the other property they bought to renovate. But how do they sum this one up? we've enjoyed the experience. We'd definitely do it again. Chatham in Kent has seen a lot of investment over the last few years. and it has been proven to be a good place to invest in recent years. So, will some property buyer's ship come in today? three-bed house with a guide price of £140,000 plus. there is no access for vehicles. Also, some pretty steep stairs and a distinct lack of windows. a pram up and down. and it looks like it has been through some rough times. It's like a prison door. assuming there is a bathroom upstairs. And the kitchen, this is a great size. when it is as big as this. A real sociable area, no problem getting in your dining table. You could really benefit, obviously, from a new kitchen. Back door leading to the garden. I will investigate that further later. you could think about making into some storage space. And a good-sized reception room. because you've got your patio doors that lead out into the garden. This half, not so good. It is just really dark because there isn't a big window there. so it seems that planning permission would be possible. Upstairs to a really good-sized...bedroom. Really good. loads of light coming through. And the size! When you look at this cupboard area, it's big, almost too big. maybe you could get an en-suite in here. It would add something to this room. A shower room or you might even have room for a proper bath and shower. It would certainly add a bit of wow factor. And then you have a smaller, much smaller room, a single. This place has got family house written all over it. You could get a cot in there, or you could have a study. but just now you've got your shower in your bath. And through to a really good-sized double room. So, the layout really does work for family living especially. depends if it is not too big a job. Looking into plumbing first - you might not have the budget. There's so much work that needs done that is just cosmetic. It just goes to show you shouldn't judge a book by its cover. but outside, well, this book has a promising plot. I've seen enough overgrown gardens, not to be fazed by a few weeds. but I can see this layout working. down the slope, and it is not too steep to see how this could work. It has got certain charm. It goes down to a little shed. it is about seeing past the problems and seeing the potential. need imagination, elbow grease and a couple of skips, I think. We asked along a local estate agent for his opinion. There is an awful lot of work to be done here. kitchen, and that kind of thing has all got to be done. so therefore I'd have a regular income coming from it. so let's hear valuations for both sales and rental. This is a good-sized house with a layout that works. The work that does need done seems to me to be mainly cosmetic. also the lack of access. It is a modern three-bedroom end-terrace house for improvement. Where are we going to start on that one? I am on the way. 125, I've got. 130 now, do I see? 135. 140. 140, sitting down at the back. The bids are flying in. We leave the auction there and return at 175 grand. First time at £175,000, then. At £178,000, sitting down in the middle, for the first time. 178 for the second time. Third and final time at £178,000, are we all done? Yours at 178, and it's W447. it was bought for £178,000 by Leslie and her partner Darren. development together, so I'm excited to hear their plans. Talk me through - why auction, why now, why this property? and saw this one, and then decided to go for the auction. How much homework had you done before auction? How much time had you spent looking at places? rather than living in something. First auction we went to, first property. Yeah, we expected to come home with nothing and came home with this. Fantastic. What do you both do? Are you in the property business? teas instead of money, so that might come in handy. You will be an absolute godsend to a place like this. -And what about you, Leslie? -I work for the police. -So I'm a receptionist, so very, very different for me. Talk me through from coming in the door, what you plan to do. gut everything out, including the garden, get rid of all the rubbish. New carpets and flooring throughout, once we are done. Yes, we have got some windows that need doing. It just feels like it could do with another window. Inside it would bring in light and outside it would just look nicer. Had you given that a thought? and we thought that was quite a good idea. depends on the cost of it. but it is something that we had thought about. and are willing to adapt their plans. once they have looked in detail at the costs. -That's your... You are in charge of that. so we're now thinking maybe 10 to 12. -Yeah, thinking 10 to 12. -don't have to pay for. that you might edge over that 12, or...? but to look as good as possible as well. Now, what's your timescale for turning things around? booked in, so, yeah, about three to four months, you reckon? -Yep, lots of late nights. -..five o'clock in the afternoon and working through. pending my little boy being at school. I can't wait to see the job you do. I think you're both really up for it, and you'll do a great job. for ten months. That said, this is a big first-time project. Will that 10 to 12-grand budget really cover it? Now, not all development projects go to plan. on our final two properties. it was in pretty good condition. The bathroom was fine, the two bedrooms were nice. and really my only quibble was the kitchen. Kitchen there. Now, I have to say, a bit disappointed. if there's something we can do about that. was made by Kim and her husband Sean. and there was only one snag - a very short lease. But Kim had done her homework. -They served a notice, I mean, so it was in the process already. -So we took it over. that she'd have the work done for under 20,000 in just three weeks. Well, we are back two months later. and the space is much better used. an open-plan feel in that pokey kitchen? Taking away that stud wall to the hall was a good move. The bedrooms have been freshened up in a nice neutral colour. into a usable space with some extra storage. The real bonus of this maisonette was the outside space. revealing a really charming garden. So, given the quality of the work, has she managed to stay on budget? which would normally be good news. the couple have had to change their plan of selling this on. ..to rent it out for a long term. however not everything was as cut and dry as it seemed. we received a Counter Notice from the freeholder. this was the nasty surprise just waiting for us. had not been agreed with the freeholder. which would give her a basis for negotiation. he thinks that in the region of £158,000 is more likely. lease. That must've been terribly disappointing for Kim. so it was kind of my fault, but I have learned a hard lesson. knowing that she has no chance of a profit on a resale. which is now at a total of £366,000? starting with the agent who saw it before. This is the second time I've seen this property. so the developers have done a nice job. it's a real, good, contemporary, clean finish. There has been some intelligent design, very nice. how much could it go for on the resale market? I think the resale value of this property is £310,000. to achieve on the open market £325,000. they will make a potential loss of £41,000, including auction fees. But could they make it back in yield? The rental value of this property is £1,200 per calendar month. which is pretty standard for the area. she may be able to recoup any potential loss in the future. So, how would she sum this project up? so it is like heaven and hell. So, I will do it again. I will do it again, definitely. neglected-looking three-bed end terrace, guided at £140,000 plus. issues, while inside, the lounge was lacking some serious vitamin D.
before it could be deemed child-friendly. she had a get-out-of-jail-free card when it came to Darren's skill set. on their first-ever project together. in their three to four-month timescale? We are back just over six months later, to find out. extra dining space in the kitchen, by ripping out cupboards in the hall. In the end, they decided not to add an extra window in the living room. with new suites and fresh decor. with a large window, creating a superb dual-aspect bedroom. but how did Leslie fare away from the desk job? the basics of fitting windows cos I watched you and a friend do it. but she wasn't the only helping hand they had around the place. -You thought it was haunted, didn't you, at one point? You thought something dropped out of the loft at one stage! on the renovation and I did hear a few noises in the night-time. 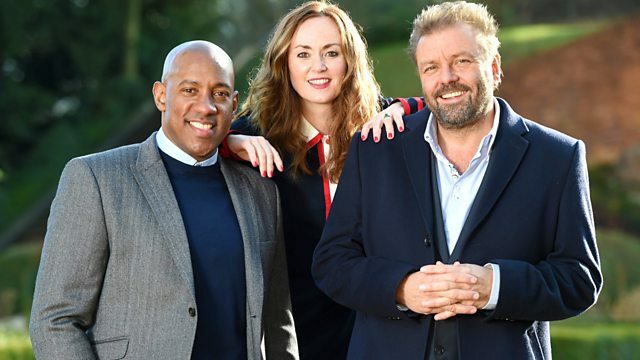 You heard it here first, Haunted Homes Under The Hammer. But did they have any less-spooky issues with the house? The biggest challenge, I would say, was the boiler. When we took over the property, it wasn't working. Darren and his dad had managed to get it working. stuff started to go wrong on it, so you replaced a couple of items. -Then eventually, we had to replace it. stuff, so we just changed the whole boiler in the end. budget, spending £11,200 in total. But did they overrun on that three to four-month timescale? so it was slightly longer than planned. -That was mainly due to family commitments. I returned back to work. And, yeah, my work went absolutely manic, didn't it? will they be back at auction any time soon? I would do it again, but I wouldn't do as big a project. time, because I think it would be more cost-effective. we chose a rather large property to do for our first renovation. project, but will the house have gained in value? starting with the agent who saw it last time. and now it has been finished and done to a really nice standard. I think the owners have done a really good job on this property. It is bright and airy and very modern. I like the layout, the kitchen is really nice. everything about the property, really. But what could Leslie and Darren get for it when they put it on the sales market? we could expect to sell this property for approximately £225,000. somewhere in the middle, absolutely fine. -It would be spot on for us, wouldn't it? that could mean a pre-tax profit just shy of £61,000. but what's next for Leslie and Darren? free time to do stuff that we want to do. Yeah, to get our life back. Rather than be tied down to being here 24/7. -But, yeah, bit of a break. Or do you fancy jumping in headfirst? inspiration here on Homes Under The Hammer. Three couples take on properties in Wednesfield near Wolverhampton, Sydenham in London and Chatham in Kent in the hope of making some money. All need modernising, but for one couple there is a hidden and very costly surprise waiting for them. Martin Roberts, Dion Dublin and Martel Maxwell follow progress on the projects.